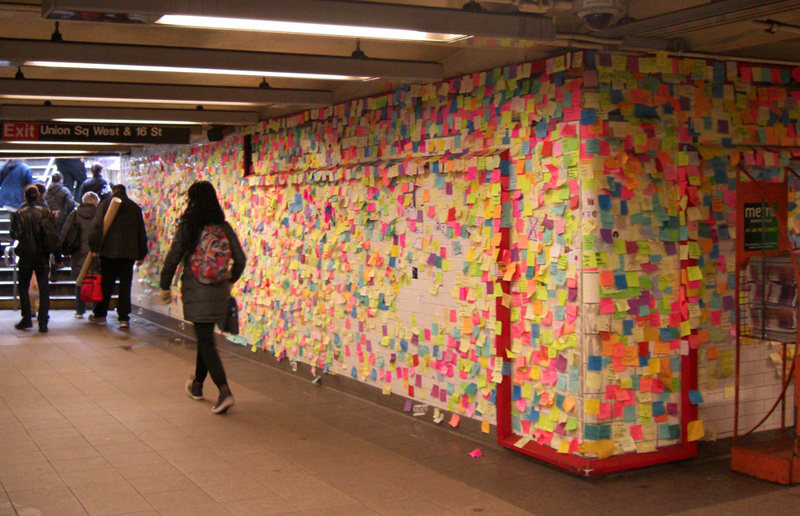 Shortly after the presidential election, people began leaving Post-It notes on the walls near the exits of Manhattan's Union Square subway station. 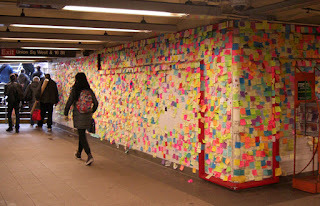 Soon the tiles were covered in a paper mosaic.The Post-Its came and went, like multicolored grass that is mown but continues to grow. Right from the start, participants understood the need to try and keep the comments positive and hopeful, to show others that there is goodness and optimism out there in the world. Now the notes have been taken down. Some will be preserved by the New York Historical Society. It is thrilling and, yes, hopeful, to know that little bits of paper can come together spontaneously in a communal art project.